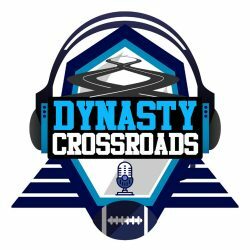 On Episode 28 of the Dynasty Crossroads, Peter Howard (@pahowdy) goes solo to break down some players dynasty values for both short term and long term. On Episode 27 of the Dynasty Crossroads (@dynocrossroads) Peter Howard (@pahowdy) and Jake Anderson (@JakeAndersonFF) discuss Broncos WR, DaeSean Hamilton from a film and analytical perspective. On Episode 26 of the Dynasty Crossroads, Peter Howard (@pahowdy) and Jake Anderson (@JakeAndersonFF) discuss 49ers RB, Jeff Wilson from a film and analytical perspective. We break down Wilson as a prospect, what he did last week and what to expect going forward. On Episode 25 of the Dynasty Crossroads, Peter Howard (@pahowdy) and Jake Anderson (@JakeAndersonFF) discuss Trey Quinn from a film and analytical perspective. Has he taken over slot duties from Crowder? We break that down and talk about his long term dynasty outlook.